If you’re looking for nursing home attorneys in Phoenix, Arizona, then you may have already discovered possible signs of neglect and abuse. Choosing to place your loved one into a nursing facility or assisted living facility is not an easy decision. It is even more difficult if you discover the facility’s staff may be mistreating your loved ones. Rispoli Law, PLLC can assist you and your family in identifying the patterns of neglect and abuse, help to put an end to it and even pursue legal action against the facilities. When a resident is injured at a nursing home or other elder care facility, it is not always easy to determine who is legally responsible. That is because it is not always obvious what went wrong and who is at fault. Discussing the situation with experienced nursing home attorneys in Phoenix, AZ like ones at Rispoli Law, PLLC could give you the clarity you need to move forward. Rispoli Law, PLLC has spent years serving families in nursing home law, working hard to get the compensation and care they deserve. Though it’s not always a straightforward case, there are certain behaviors that occur in care facilities that could point to negligence. First, your Phoenix, AZ nursing home attorneys will have to prove the facility owed your loved one a standard of care that is comparable to that of any other care facility that is of similar size and location. Then, your lawyer must prove that a staff member or nursing home facilitator breached that standard of care and their duty to provide safe and adequate service. After that, they’ll attempt to prove the injuries your loved one suffered were a direct result of the staffer’s negligence. Finally, your lawyer will help you to lay out the damages so that you can collect a fair settlement or bring the case to court. What kinds of behavior could lead to a civil lawsuit for nursing homes? If your loved one was injured because the facility was not clean or because it was unsafe, it could be argued that the facility breached its standard of reasonable care. Likewise, if a facility does not follow the proper steps to ensure residents are safe from other more hostile residents, they can also be held liable for any injuries incurred between residents–especially if they lack security. Additionally, nursing home staffers could be held liable for hiring a person and either not training them, training them poorly or neglecting to do a background check. Should that staffer injure one of the residents either by purposefully neglecting or abusing them, or unintentionally causing harm, they could be on the hook for any injuries as well. Finally, failing to provide adequate medical care in a care facility (again, whether purposefully neglectful or not) can often be seen as a breach of care. 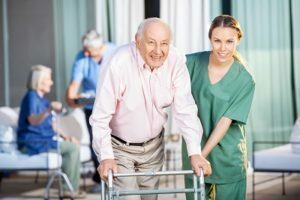 Do you need advice from nursing home attorneys Phoenix, AZ on how to proceed with a potential case of nursing home neglect? Trying to prove the elder care facility you chose for your loved one was negligent in their care? Get some advice from the attorneys at Rispoli Law, PLLC. You deserve a consultation with nursing home attorneys Phoenix, AZ trusts.